In James’s blog post about how people look at other people’s faces, he described how we are not only attracted by other people’s faces, our attention is also drawn to what other people are looking at. This is a particularly useful behaviour to act on if we’d like to draw a user’s attention to certain things. 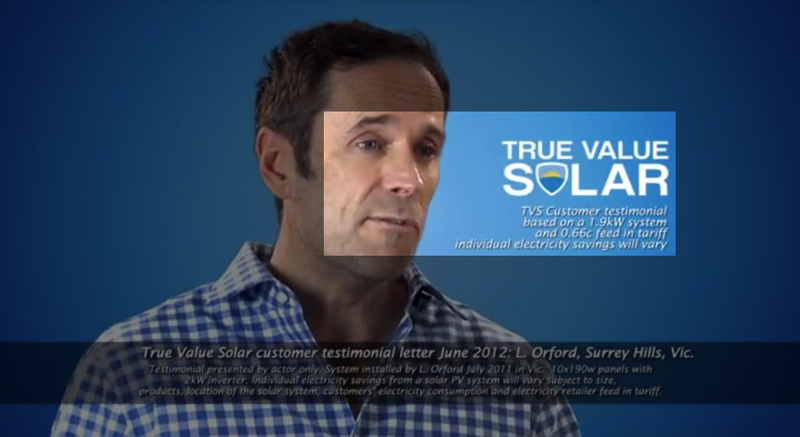 Notice how the actor’s line of sight is directly in line with True Value Solar? That’s what they want you to look at as he speaks. Visually and audibly, you are then associating the message of the ad with the logo and brand. Coincidence? I don’t think so. The ad does the same thing a few more times in the same ad: If you visit their website, you will notice how the actor in the Testimonial image is staring right at the [Testimonial] label: Very clever way of exploiting on this aspect of human behaviour. Do you see what I see?